In which I try to embrace this never ending rain. I like the way these leaves are so much more blue under a wet sky and I like sitting here at my desk next to a big white envelope with the words wild horses scrawled across it with a black ballpoint pen, which is interesting because Michael & I discussed wild horses at lunch, apropos of nothing, and here is this envelope with those very words on it, and yes, it's been here all morning, even before lunch, but Michael brought up the subject, not I. And I like envisioning wild horses racing with each other out in their wild wilderness, and what is it about wild horses that seems so much more enchanting than wild other things? I have had 3 paintings accepted for an art show that begins later this month - Shades of East Texas, it's called, and only after I received the acceptance letter did I realize that the 3 paintings I'd submitted were all about storms. The description of artwork to be considered had said whatever East Texas means to you, and I thought I didn't have much that was really about East Texas except maybe my tornado painting - and in hindsight I think perhaps I should also have submitted my tornado drawing, which y'all have never seen, but it's behind glass and I didn't have a photograph, and the deadline was pretty much right then, so I didn't - but like I said, when I got that acceptance letter & read the titles of the paintings listed one right after the other, I realized how much where you are affects your work. Bridgette talked about that after she moved to Chicago, and it had become obvious that her color palette was changing, but I just thought about it re: Bridgette. Never thought about it re: me. And I don't know what to say about it other than what a surprise it is to realize this something new about myself, but I like it, and I think the stuff that speaks about me here, whether I knew it or not at the time, is some of my best stuff. And most of it is recent stuff, which makes me happy because can you say growth?, and if I think about it, it is always the stuff that comes easiest. Hmmm. How revealing. I've been keeping paintings in my head for a few months now, but am feeling the urge to pick up a brush, and I don't know why this always hits me when we're absolutely at our busiest at work - I will have to think about that, because it just now occurs to me that perhaps painting is a way to relax, even though I've always said it isn't relaxing, and it's not, it's exhausting, so maybe it's not relaxing, maybe it's releasing, and oh, I don't know. blue leaves intrigue me as well..so much symbolism in this post..will the show be in your city? 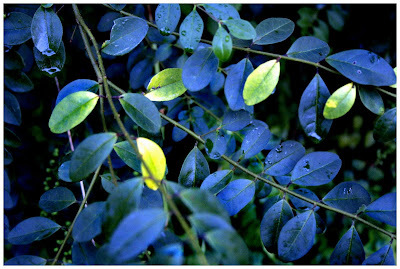 These leaves are beautiful, chasing the chill, and wearing it for a tinge of blue... Congratulations on your artwork - yay! I hope we get a chance to see the paintings... and yes, it is sometimes like birthing, no? Exhausting and exhilarating all at once with a calm that can peak now and then. congrats on having your paintings accepted !! and I know how you feel about painting being relaxing...but it's not...it's stressful...but in reality it takes your mind of off other things....so it really is relaxing after all, maybe....I get it !!! elk - Yes, the show is here. It will be at the Main Street Gallery, a new gallery downtown - we are trying to build an arts presence in our downtown, but we will see. There is really no link I can provide at this time because they have another show there right now & that's what they have up. Pixie - Thank you! I will post the paintings later, but they are not new - they've been up before; indeed 2 of them are viewable by using my artwork link. I'm really happy about the show - thanks again! Beth - Yes! I keep thinking if I had a studio space with a door I could close, it would be less exhausting. If I could actually walk away & not see the work, get a true visual break, that I would be less stressed. The day will eventually come (surely!) when I have that, but for now . . . well, it is what is! LOL! I have a little cousin named Storm...I have been wishing my name was Storm ever since! How strange..wild horses. Last night on the radio they were talking about wild horses, and how the Obama administration wants to move thousands of them into protected areas. Then I come here the next morning to see wild horses in your thoughts too. Congrats on the show! You are putting your work out for the world to see in so many ways this year...it is so so SO wonderful! The world needs to see your work. I think I need to move to Texas...just for the storm action. And to chit chat over tea with you! Oh, congratulations!! I am so excited for your next show.